All new beginnings are hard - especially when moving is involved. One of the many challenges it entails is that you have to make many decisions which are all very important: where to live, how the first day at work will look like, how to commute, what budget to expect, how to settle in. With the rise of personalization for consumers, employees are expecting more. A generic approach of one-size-fits-all doesn’t work anymore. Today’s new social generation expects an outstanding employee experience. Decisions can be made much more efficiently if you know what other people have done in similar situations. And that’s where Benivo’s Social Insights come in. Many relocation companies and large employers offer area guides that help employees find their feet in their new location. But these guides are often generic and don’t get updated very often. Frankly, employees will often learn more through a quick Google search. Generic information is simply not good enough in an age where consumers are used to printing their photo on M&Ms and custom-designing their Nike sneakers. Personalization has arrived in the mainstream. With Benivo, you have the perfect partner who helps you unlock this vital information inside your organization. Benivo’s hyper-local city guides tell it like it is. Employees learn which neighbourhood others have chosen, what sort of accommodation they prefer, how much rent they pay, and lots more: where to eat, shop, socialize, and even go for a run. Sure, people know Trustpilot and use Facebook and Google Maps to read local business reviews. But these represent a broad cross-section of the population. Wouldn’t it be much better to show choices that similar people have made? Benivo’s area guides don’t just describe what a city is like but what it is like for employees of your company at the same level in the organization. 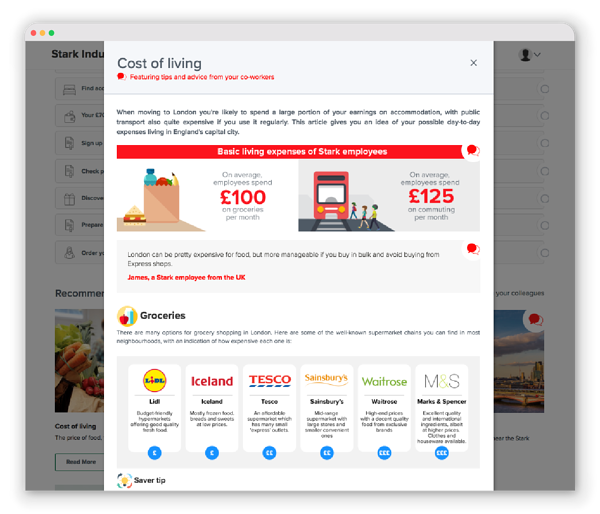 With Benivo, you can show relocating employees their peers’ choices in aggregate. Now, that’s really useful data! Among other things, this view illustrates perfectly how different a given company’s employees are compared to the local population average. For example, 11% of the population in the city commute by car, but none of your colleagues do. Hence, there is no need to think about buying a car. That’s one less decision to make. Or let’s look at sharing accommodation: 30% of the city’s overall population do it, but 64% of your peers have roommates. Of those who do live alone, very few take anything bigger than a studio. Knowing this in advance saves a lot of time and stress. And reducing stress when moving home delivers outsized returns. 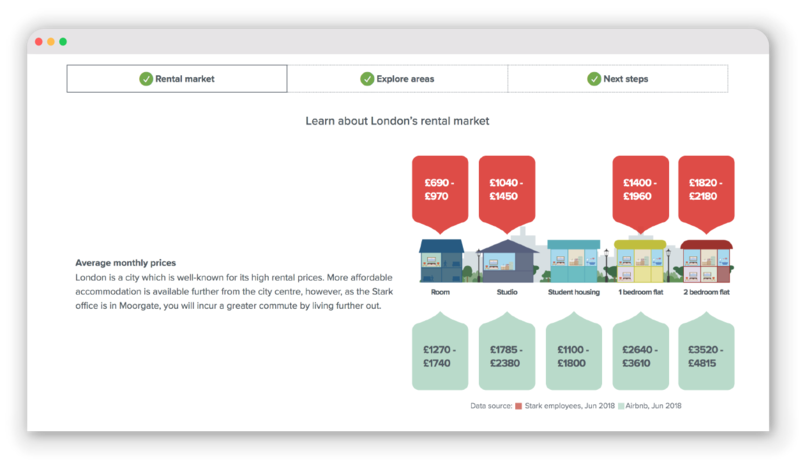 There are many tools that help you find out cost of living in a city. But how much do people spend who are similar to me? And what do they spend it on? Am I spending above or below average? 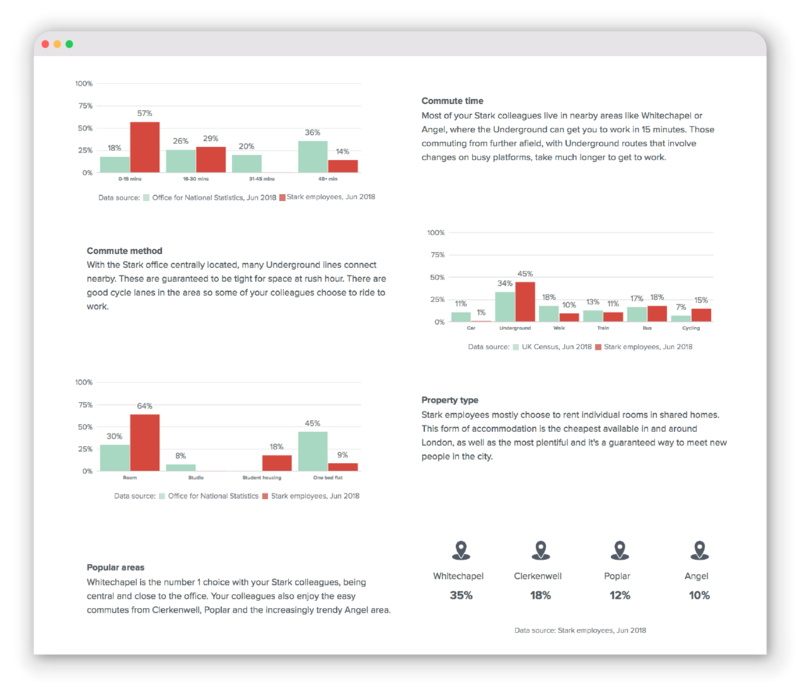 Benivo’s hyper-local, hyper-relevant data delivers the answers to all these questions in a beautifully designed and engaging format. This boosts your employer brand and shows you are up to date with how the new generation of digitally savvy employees make decisions. Benivo’s platform is built for sharing. Employees see value in what others do, and they happily share their own experiences, tips, and advice. What if you are just starting out with Benivo? Or what if you have a small number of employees per location? After launching in hundreds of cities, Benivo has developed solutions to ensure that your employees have an outstanding experience, no matter if they are the first or the 1,000th employee to do so. Contact us today to find out how. With this highly personalized approach, we combine the power of the crowd with the power of the cloud to create location guides that are truly customized to your organization and your team. Benivo - bringing Destination Services into the 21st century.